$100 Worth of goodies Isola Bella Goodies. 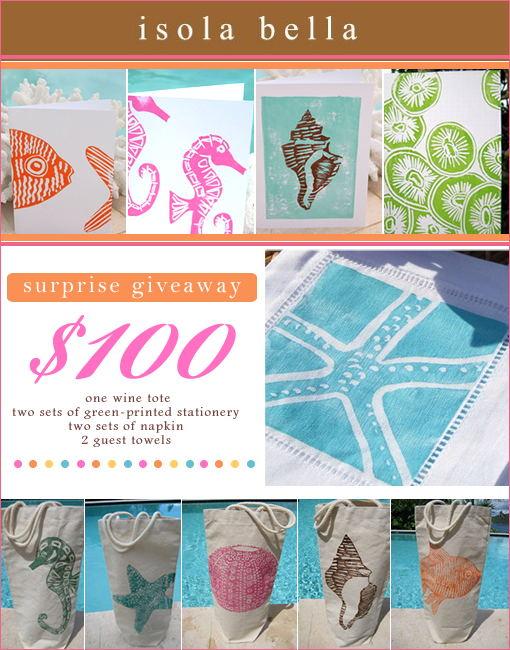 The winner will receive one wine tote, two sets of green-printed stationery, two sets of napkins and 2 guest towels of their choice. Isola Bella’s wine totes make the perfect eco-summer wedding favor filled with the bride and grooms favorite bottle of course. They are an eco-friendly company. All of the inks used are water-based and non-toxic. All of the note card sets are printed with vegetable inks on FSC paper. Just leave a comment letting us know which of Isola Bella’s product you like best. The contest ends next Tuesday (02.09.09)… feel free to enter every day until then. Thank you to all who entered a winner has been choosen for this giveaway!